PASADENA — The Yakumo Academy girls high school basketball team from Tokyo will be visiting Southern California this week. Nationally ranked, the team is a perennial power in girls’ basketball in Japan and has competed in the high school national championships this season. 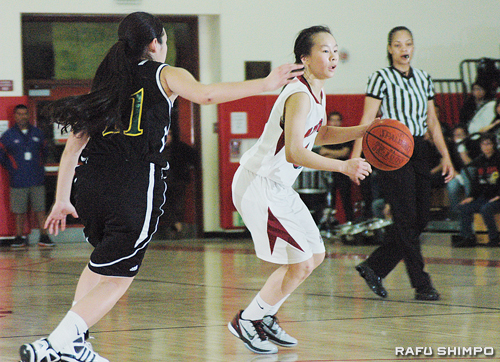 A goodwill game between Yakumo and the Mark Keppel High School girls varsity basketball team is scheduled for Monday, March 25, beginning at 7 p.m. and will be held at the Mark Keppel gymnasium, 501 E. Hellman Ave., Alhambra. Parking is available on Hellman Avenue. Yakumo Head Coach Yuko Takagi has served for over 25 years and considers this year’s team to be one of her best even though no player is over 5’9” tall. The Mark Keppel Aztecs, under the guidance of Coach Joe Kikuchi, enjoyed a very successful season, capturing the Almont League Championship with a 10-0 record and advancing to the CIF Division 2AA Southern Section Semifinals and the second round of the CIF Division II State Championships. Both teams look forward to the opportunity to meet new friends and to learn about the similarities and differences between American and Japanese basketball. Under the leadership of Principal Akio Kondo, Yakumo Academy is a private 7th-to-12th-grade girls’ school established in 1938. Located in Tokyo, it has an enrollment of over 900 students and an outstanding college preparatory academic program. Yakumo athletic teams also excel in volleyball, handball, track and field, kendo, karate, tennis and drill team.